Do you need or want to lose weight? Looking closely at what you eat and drink, when and why so that you can find ways to tackle bad habits which are making you put on weight. Food logs are all very well, but you need to understand what is causing you to eat when you do and what's behind your motivation for choosing the food you do e.g. what is causing you to eat a take-away every night with two helpings of chips? What are you hoping those servings of food will give you? What do they give you? How else could you get it? Persistence - keep at it! This means not assuming the world will come to an end and that you're a failure just because you slipped up and had huge slice of cake with a cup of tea. These things happen. Learn from other things you've succeeded at in your life. What factors have contributed to your success? How can you use those factors or strategies to help you succeed in losing the weight you want? Always check with your GP before starting any new exercise programme. A willingness to change your current bad habits & replace them with positive healthy habits long term - or the weight will just come back on. If you make lifestyle changes now - such as doing some of the above - that you won't be able to keep up, the weight will more than likely come straight back on. The polar bear gives an excellent example of someone who has changed his lifestyle habits to get the result he or she wants. 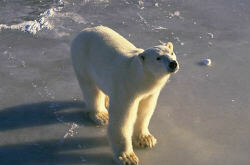 Scientists estimate that polar bears have lost weight and that they are having to swim and walk further to find food. Others are heading into town to see what they can get there (and they're being airlifted by helicopter back home). In the case of the polar bear, he or she has had no choice in most areas where polar bears live but to change lifestyle and work harder to get food. This is just an example of an animal who has had to change strategies to get the desired result - in this case, food.